The Royal Air Force Charitable Trust is delighted to welcome three new members to its board of trustees. 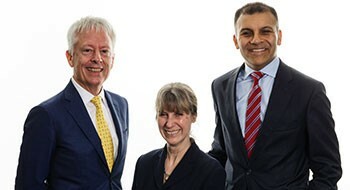 Raj Mody, Felicity Chadwick-Histed and Stephen Barrett joined the charity in March and between them, possess a vast array of experience and knowledge to benefit the charity. This now brings the total number of trustees to ten. Stephen was brought up within the RAF family, but myopia dashed hopes of a career piloting fast jets and so, after university and law college, he qualified as a solicitor and worked at two major law firms within their corporate and capital markets practices. From the law he moved into investment banking as a deal advisor and originator, initially managing and then in a senior director role leading merger and acquisition, public securities offering, restructuring and privatisation transactions. He subsequently joined a global consulting and professional services firm as a senior partner, chairing the firm's international corporate finance advisory business, developing its risk management function and leading global service delivery to key client accounts. Latterly he has assumed a number of public sector board advisory and non-executive roles, including nine years' service as a Royal Air Force non-executive director and member of the Air Force Board.